Frame selection and lens choices can be overwhelming at first. However, our experienced opticians will help you select a frame that fits and looks great on you, as well as help you select the lens options that are best for you. Every person’s prescription and vision needs are different, and our opticians will consider these factors when helping you make your selections. Whether it’s your child’s first pair of glasses, your first pair of bifocals, or glasses after your cataract surgery, we are here to help. 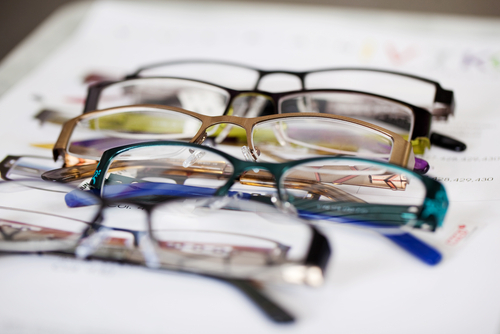 Each of our offices is equipped with a full optical shop carrying a wide variety of frames and sunwear. We have a wide selection of different brands, like Nike, Guess, Ralph Lauren, Calvin Klein, Flexon, Marchon, Nicole Miller and Columbia. We work with labs that produce excellent quality lenses, and carry a vast variety of different lens types and options. We carry non-prescription sunwear, and our sunglasses can be ordered with prescription as well. Plastic is thinner and much lighter weight than older glass lenses, but not quite as thin as newer polycarbonate and hi-index choices. They are a good choice for people with lower prescriptions. Polycarbonate lenses are a great option for many people. They are thinner and lighter weight then plastic or glass, and they also have built in UV protection even though they are clear. They are more shatter-resistant than plastic or glass as well, making them the lens of choice for kids and teens. These lenses have a higher ability to bend light than either plastic or polycarbonate, making them one of the thinnest and lightest weight options for high prescriptions. These help you avoid a “coke-bottle” appearance to your lenses. Glass lenses are safety tempered to help with impact resistance, but are still more prone to shattering than any other lens option, and so should not be worn for activities that require safety precautions. Glass lenses are also quite heavy compared to other choices. Many people wish to have bifocals without a visible line and chose no-line bifocals. This style has the advantage of distance, intermediate and near all in one lens, with the portion for reading close to the bottom of the lens. Your vision is optimized when looking through the center area of the lens, while looking through the sides of these lenses does have some mild distortion or wavy vision. You have to adjust to this and learn to point your nose at what you are looking at instead of just moving your eyes. Anti-reflective coatings help cut down on annoying reflections and glare that cause decreased vision while driving at night or working with computers. They allow 8% more light to reach your eye, giving you crisper, sharper vision. These lenses are also less visible to others, letting them see your eyes instead of distracting reflections off your lenses. They should be cleaned with microfiber cloths. Also called photochromic lenses, Transitions darken when exposed to UV light, such as on sunny days, and clear up when indoors. They are a great option for people who do not wish to be switching between their regular glasses and sunglasses all the time. They work the best in cold weather, and are slightly less dark while driving due to the UV blocker in most car windshields. The newest in Transitions is their XTRActive lens, which gets even darker than their average lens. Polarized lenses are a great option to eliminate irritating glare that reflects from other cars, roads, water, snow, and your windshield. Regular sunglasses only darken your surroundings, whereas polarized sunglasses darken and reduce glare. They are highly recommended for driving, and other outdoor activities like fishing and skiing. Some lenses have built in UV protection, but if not, this is a clear coating that can be added to other lenses. UV light is as harmful to your eyes as it is to your skin! It contributes to dryness, cataracts and macular degeneration. There has been much concern recently over how blue light from devices and electronics is affecting our eyes and health. Studies are ongoing, and some are finding that blue light can have detrimental effects by contributing to retina cell damage and disrupting our sleep cycles. Special coatings for lenses have been developed that help block these specific light rays.